I cannot believe 30 days is over just like that. It is amazing how time can fly when you are having fun. This challenge provoked me in so many ways. Many of which you will see on camera on the Troy Show Reality Special airing on Kenosha Channel 14 on Time Warner Cable this May. This big question is how much weight did I loose? That is the measuring stick. I lost about 10 pounds as of this writing the entire month. After the initial burst of weight loss, I started loosing 1-2 pounds per week. There is more to the story however. I didn't run around or exercise as a kid. I was never involved in sports. I was always book smart, not physical. The most I moved my body was walking to and from my car. So when I walked into the gym, I was frightened. I had to face the very fear that kids teased me about. It was like walking in the doors of high school all over again. This time however the results were different. Each day and each week I built muscle and started to look more favorably on working out. It started becoming less of a diet, and more of a lifestyle change. I love the gym now. I plan on becoming an active member and to continue the healthy eating habits I have learned throughout. I want to thank Anytime Fitness and Trainer Sam Sackett. Who with his patience never gave up on me. I call him the miracle worker fitness trainer! I want to thank Dr. Susan Smith Jones. 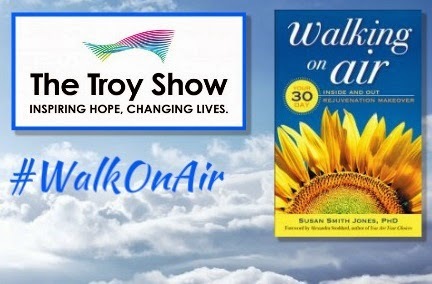 Her best selling book "Walking on Air: Your 30-day Inside and Out Rejuvenation Makeover", kicked off this challenge. If you haven't heard our 3 part audio series, you should. It will get you moving as well. A big shout out goes to Target for allowing our cameras in the store on such short notice. They blocked off the area for me! How cool is that? The takeaway from all of this is that in order to be our best selves we have to face our fears. It doesn't matter how many days, weeks, months, or years you have told yourself the contrary. We become so comfortable in fear it holds us hostage. Today on April 30th, 2014! I am free! May the Journey Continue!